To early people, the evergreen was the symbol for eternity or something that perpetually renews itself. 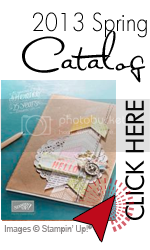 Likewise, you’ll find endless ways to use the silhouette, outline, and script images in the Evergreen stamp set. Of course, you’ll love the many variations of Christmas cards you can make with stamping, heat embossing, Stampin’ Dazzle Markers, and more. The somewhat abstract tree image lets you achieve looks from simple to over-the-top. But what you may not have considered is how perfect the Evergreen stamp images are for those elusive masculine cards! Or use them to create notecards or thank you cards. The stamp set is also ideal for autumn and Thanksgiving themed cards. Talk about timeless! I think this is a stamp set you will turn to many times, year after year. So order your Evergreen stamp set today and get ready for perpetual creativity! I am starting a new feature on my blog. Make Over Monday...I am going to take a card from a magazine or a blog I have seen, then remake it with only Stampin Up product. I have my first attempt here. I would love to know what you think of my final project. I found this cute card by Amy Sheffer..she does beautiful work. 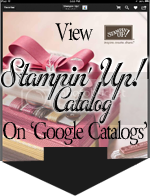 I used products from the Stampin UP Holiday Catalog...that will be Available August 1st...OMGoodness!!! I am in love with everything in this new catalog. Can't wait to share it with you. The card on top is the one by Amy and the card below is my remake. SU no longer carries the striped ribbon, so I used a piece of our DSP, I used my bone folder to break down the fibers in the tangerine tango and old olive card stock to make it look more like a ribbon. I used our Spider Web Embossing Folder for the dry embossing, and our Doily Sizzlet Die , cut to a smaller size. The background image at the top of the card is a new wheel Estrucan Elegance (available Aug 1st) stamped in versa mark then embossed with pewter. The stamp is from Toxic Treats (available august 1st) I hope this inspires y0u to look through your supplies and see how you can take a design, then make it with the supplies you have available. If you are interested in any of the products I used in this post you can Click on my Shop Now button and purchase them from my online store. Have a GREAT Day and Happy Stamping!! !